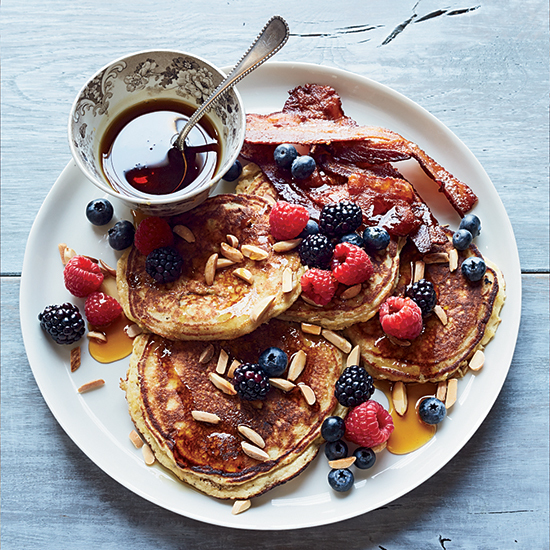 From delicious, fruit-packed pancakes to savory mini-pancakes, here are seven healthy recipes to make in celebration of National Pancake Day. Using polenta (cornmeal) adds both protein and fiber. Ready in just 20 minutes, this apple-studded pancake is delicious for breakfast or dessert. Coconut flour gives these simple pancakes their fantastic, airy texture. Serve these savory pancakes with herbed yogurt or smoked salmon. A sweet-tart raspberry syrup pairs perfectly with these fluffy flapjacks. These crisp pancakes are made with fine stone-ground cornmeal. Top these with mild honey such as clover, sage or star thistle.